I work out hard. Yoga. Circuit training. Stadium workouts. Long runs. Barre class. Yup. I like food. I love food. Dark roast coffee. Ice cream. Warm pita and hummus. Yes please. But what I'm really interested in is nutrient-dense super foods. I have a huge appetite and a fast metabolism and I think the worst thing is tanking half way through a workout. You know that feeling? I'm working out hard, I'm doing great, and then I tank. I get nauseous, dizzy and chilled, I start yawning, and it's a struggle to finish out. I usually don't experience this during long runs or steady state cardio, but I've hit that wall during power lifting and stadium workouts and then recently during barre class. And when that happens, I know it's because I didn't drink enough water and I didn't fuel up. I'm not a personal trainer or a nutritionist, but I do know my body. Inspired by Camilla Saulsbury's Date-Sweetened Quinoa Power Bars, I started making my own bars. And honestly? They're the perfect pre-workout food. My recipe is simple to make and has athlete-friendly foods: complex carbs in the form of oatmeal, nut butter, and optional protein powder. I call them super bars, because they're tasty and, well, because I feel awesome when I eat them. Snack. Run. Neon. Let's do this. Grind the oatmeal for 10 seconds in a food processor or coffee grinder or until it resembles a coarse flour. Mix the oatmeal with the coconut, raisins, cinnamon, and protein powder. Grind the dates for 30 seconds or until they form a rough paste (I grind the dates a 1/4 cup at a time). 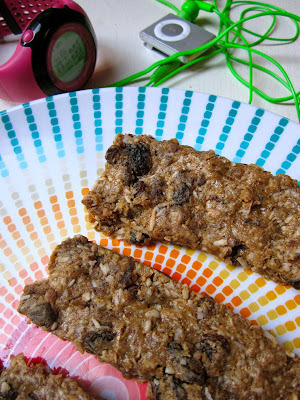 Add the date paste to the oatmeal mixture. Then add the nut butter tablespoon by tablespoon, mixing well with your hands. The mixture should look like coarse crumbs and should be very sticky to the touch. Press the mixture into a glass pan lined with aluminum foil or into a foil disposable pan (I like the loaf pan size). Smooth the top and refrigerate at least two hours. Cut into squares. The bars are tasty eaten on their own or crumbled over Greek yogurt.